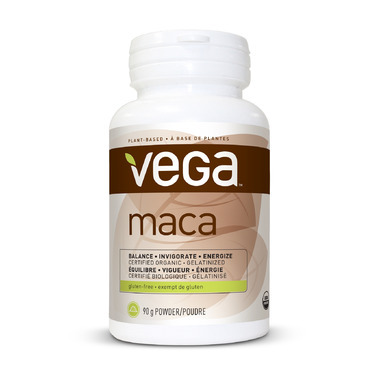 Balance, invigorate and energize with Vega Maca. Ancient, native Peruvians used maca root for thousands of years as both a food and a tonic. They believed maca increased energy and stamina. Certified organic, traditionally grown in the Andean highlands and sustainably harvested in partnership with Peruvian farmers, premium Vega Maca is produced using a proprietary heat extrusion process called gelatinization to improve absorption and concentrate the active micronutrients within. Recommended Dose (adults): Take 1 tsp. daily with meals or as recommended by a health care practitioner. Keep in cool, dry place with lid tightly closed. Do not refrigerate. Great product! Excellent flavour for smoothies and yogurt.